This particular button has a yellow body and LED and is latching on/off. The two switch contacts are either connected or disconnected. When you push the button they will switch from one to the other, like an on-off switch. The LED is separated from the button, so you can make it light up when on, light up when off, always lit, etc. Chip Quik SMD Removal Kit with Lead-Free Alloy — SMD1NL	781 грн. 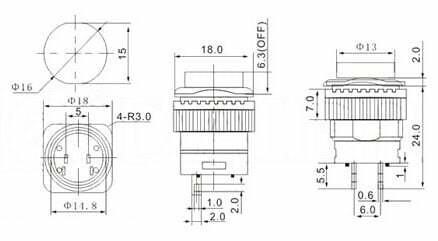 Medium Vibration Sensor Switch	53 грн.